If you're a wildlife lover, and love the idea of your money helping out the exotic animals you're gazing at, then a new tour from the Humane Society International is just for you. HSI just announced invitations for 21 trips in 2011 to the SanWild Wildlife Sanctuary in South Africa, which rescues and rehabilitates wildlife including lions, giraffes, zebras, hippos, warthogs, elephants, and many more. The cost of the trip (from an affordable $2,500 per person, including six nights in a luxury tent or chalet and meals) helps fund the sanctuary's wildlife programs, which provide relief for animals that are victims of poaching, snaring or car accidents. The inaugural trip runs from January 16 to 22 and is the first of the HSI's Humane Travels initiative. Launched on November 5, the program will provide travelers with the chance to see sites where HSI has worked with animal protection programs, and how their travel fees can make a difference. Future trips could include destinations like Bhutan, Guatemala, and Canada. The SanWild trip appears to have a nice balance of education and adventure, with travelers spending part of their time learning about and observing the animals at the sanctuary and the rest exploring South Africa's breathtaking landscape. 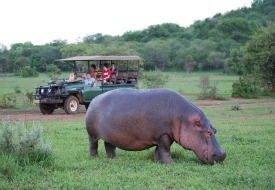 Itinerary highlights include a day at the world-famous Kruger National Park, one of the largest national parks in the world and home to more than 500 bird species and 140 types of mammals; excursions to waterfalls, the world's largest living baobab tree, and the Blyde River Canyon; and nighttime game drives. SanWild is a destination itself as well, boasting stunning gardens, swimming pools, and wildlife viewing drives and walks. Plus, the watering hole below the camp is popular with elephants, giraffes, and zebras. Travelers can choose from four luxury chalets at the Savannah Camp, which boast full bathrooms, satellite television, and traditional thatched roofs in a garden setting, or the Bukisa Camp. Almost as posh as the chalets, the Bukisa Camp is essentially "glamping," with four safari-style tents, each equipped with electricity and a full bathroom, overlooking the Drakensberg Mountains. In the evenings, guests – there's a max of 16 allowed per trip – gather in the common area, which includes a lounge, dining, and pub area with a fireplace, plus a rock swimming pool. Trips do not include airfare (you'll have to fly into Johannesburg and drive and/or fly into Hoedspruit or Phalaborwa) or alcohol, but do cover airport transfers, meals, activities and game drives. To register or for more information, visit www.hsi.org/southafricatrip.